Argentina May Day Revolution always occurs on May 25th of every year in Argentina. 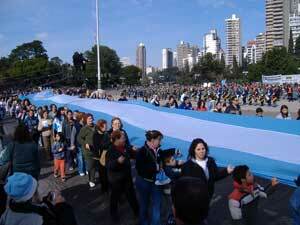 It celebrates the first independent government established in Buenos Aires (the capital) on May 25, 1810. It is celebrated in remembrance of gaining an independent government and pulling free from their Spanish monarchy at last. It was a small 'revolution' that just really implied forming a new government, but the effects lasted a long time. The holiday began by a series of political events lead up to the formation of a local independent government that had control over some of Argentina. Then in Buenos Aires the main government was switched to local and therefore gained independence from Spain.